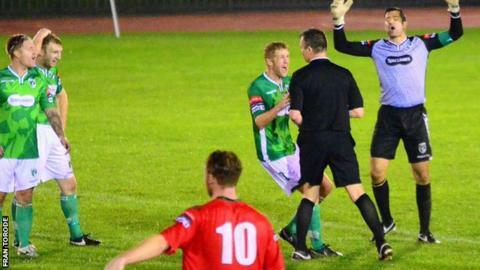 Guernsey FC boss Tony Vance says Luke Winch let down his team after being sent off four minutes after coming on in their 3-2 loss to South Park. Matt Loaring's early goal gave Guernsey a half-time lead but Kofi Quartey levelled soon after the break. Kieran Lavery put the visitors in front after an hour, with Winch sent off soon after, before Quartey got the third and Ross Allen got a consolation. "He'll be disappointed, he's let the lads down," Vance said of Winch. The forward was red-carded after an off-the-ball incident and capped off a controversial night for the referee, who was booed off by the Guernsey fans at Footes Lane. "That's Luke Winch," Vance added to BBC Radio Guernsey. "He can be sublime, he's an unbelievable talent and he can be exceptional. "He can give so many magic moments and you heard the noise when he came on as the crowd were really excited, but then they saw an area of his game that they'll now probably understand why he doesn't start games sometimes." The result means Guernsey miss out on the chance to go into the play-off places in Isthmian League Division One South and drop to ninth in the table ahead of Saturday's trip to leaders Folkestone Invicta. "I'm not allowed to comment on the referee's performances," Vance added. "People saw the game, he didn't cost us the game. There were some strange decisions but I'm not really allowed to comment on his decisions. "We made some poor decisions as well, ultimately I think it's three points that we've lost."